CHICAGO (Reuters) - Quarterbacks went one-two at Thursday's NFL Draft as the Los Angeles Rams took Jared Goff with the first pick, and the Philadelphia Eagles followed suit by naming signal caller Carson Wentz with the second choice. It was the third time in the past five years that quarterbacks were taken with the first two picks of the National Football League Draft, a testament to the league's more wide open, pass-happy thrust with rules tailored to bolster scoring and foster player safety. For the Rams and their new quarterback it was a California dream come true. The California native and three-year starter at University of California, Berkeley, will be a face of the franchise when it returns to Los Angeles after 21 seasons in St. Louis. 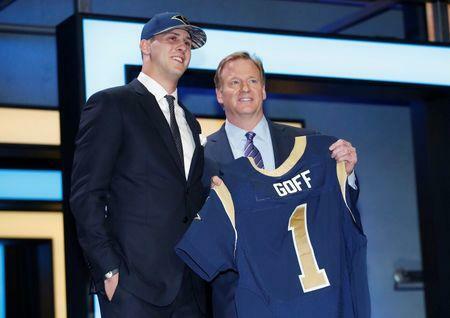 “Just truly a dream come true,” Goff, 21, said. The Rams traded up to take the 6-foot-4 (1.93 m) Goff, dealing numerous later-round picks to the Tennessee Titans earlier this month to acquire the first overall selection. “I’m taking it as an honor and I’m going to have to prove them right, that they made the right decision,” said Goff, who last season set Pac-12 conference records for passing yards and touchdowns. Wentz, 23, a rugged 6-foot-5 (1.96 m) quarterback who led North Dakota State to two successive conference titles, showed off his strong, accurate arm and toughness by coming back from a broken right wrist to play in their championship game. 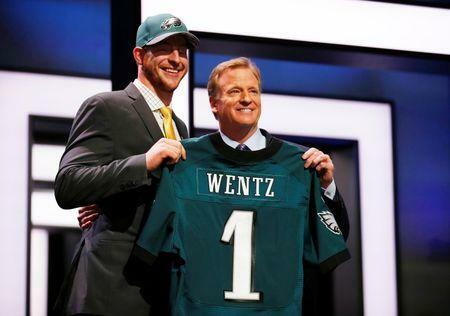 "I'm happy to be an Eagle," said Wentz. "I'm bringing it. They're getting a passionate player. I'm pumped to be an Eagle and ready to go to work." Los Angeles and Philadelphia both traded up to get their quarterbacks of the future. The Rams, who were third in the NFL West with a 7-9 record, were initially slotted for the 15th selection but sent a passel of picks to the Tennessee Titans (3-13) to move up to number one. Philadelphia (7-9) acquired the No. 2 overall choice in a trade with the Cleveland Browns (3-13), in another package of later picks in this draft and some future selections. 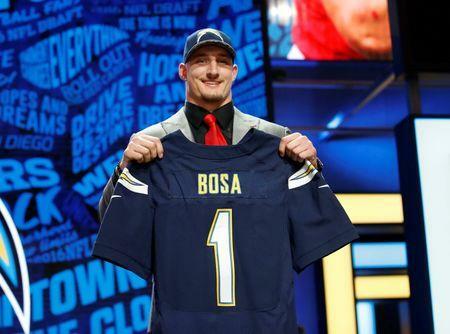 The San Diego Chargers broke the quarterback chain by taking Ohio State defensive end Joey Bosa with the third pick and the Dallas Cowboys followed by claiming another Buckeye, Ohio State's dynamic running back Ezekiel Elliott. All in all, five players from Ohio State populated the first round. The bold moves to trade up to the top of the list was a strong indication that the top quarterbacks would go one-two. But there were a share of first-round surprises in the draft, the primary team-building opportunity in the most popular of U.S. professional sports leagues. Myles Jack, a standout linebacker from UCLA, failed to be selected on the first day of the three-day draft over concerns about a knee injury that sidelined him all of last season. Just one other quarterback was taken, as the Super Bowl champion Denver Broncos traded up from 31 to 26 to claim Memphis signal caller Paxton Lynch. The biggest shock involved top tackle prospect Laremy Tunsil, who tumbled down the list before being selected by the Miami Dolphins with the 13th pick following a controversial video posted on his Twitter account. Just minutes before the draft, the former University of Mississippi player was shown wearing a gas mask and smoking something through a bong. The video was quickly deleted and Tunsil suspended his Twitter account. The tackle later said his account had been hacked, but teams steered clear of the player who had been expected to go near the very top of the draft. Only 31 selections from the 32-team league were made as the New England Patriots had their pick No. 29 stripped as part of Deflategate punishment. Rounds two and three will be held on Friday, with the last four rounds conducted on Saturday.